Bloycey's Blog: #6 Amartya Sen. Beer. Brownies. #6 Amartya Sen. Beer. Brownies. 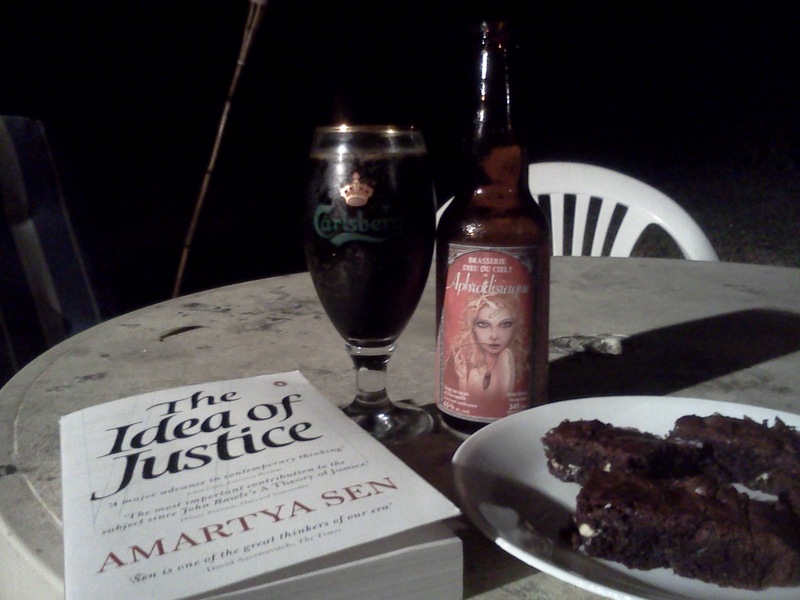 My Sunday night has comprised of reading Amartya Sen's book 'The Idea of Justice', drinking a superb beer called 'Aphrodisiaque', and eating chocolate brownies. It could be the incredible potency of the beer (it packs a considerable 6.5% ABV) but I'm feeling pretty good about life in general at the moment. I got a call earlier this week to inform me that I'd got the job at QPAC, tomorrow night we're hosting a party, and swotvac has just begun. Anyways, I'll tell you a little about 'The Idea of Justice' based on what I've read so far (I'll be sure to write a better review when I've finished reading it). I hadn't read much of Amartya Sen before I bought 'The Idea of Justice' so I had no idea whether or not it would be my sort of style at all. As it turns out I find Sen incredibly easy to read and very engaging. His prose reminds me of reading Peter Singer (although obviously the content is quite different), it isn't unnecessarily academic or esoteric (as a lot of philosophy can tend to be) yet at the same time it doesn't undermine the intelligence of the reader. As the title suggests the theme seems to be concerned with 'justice'. Most of the philosophy that I read is concerned with morality or ethics and seems to focus on 'right-ness' or 'wrong-ness' of the decisions that we make. 'The Idea of Justice' takes a broader look at morality and focuses on the institutions and social systems that we live in. 'The idea of Justice' has the same sorts of aims as Rawl's 'A theory of Justice' and Nozick's 'Anarchy, State, and Utopia' and could probable be labelled as a sort of political philosophy. I'm only 87 pages in so far so I can't really tell you much about Sen's theories yet, but I can tell you that Sen's work is worth reading if only for his prose and background. So far I've learnt about Ashoka Maurya and the ancient approaches to justice of Niti and Nyaya. It feels good to hear about the history and philosophy from non-western countries and it is, I think, hugely beneficial from a philosophical perspective to do so in order to avoid cultivating a 'west is best' prejudice. Anyhow, so far Sen hasn't actually began explaining his own theories and has just explained how and why his theory will differ from the Rawls' 'Theory of Justice' and the problems with trancendental institutionalism. #4 - Earthlings. And why I am a Vegetarian. #2 - The Catcher in the rye.